I saw these two paddle switches on a LJ thread and decided to replace the original switch on my Craftsman 113 contractor table saw. I ended up with both of them, so I can review both a bit on features and installation. I can’t say too much yet about long-term performance. The Woodstock D4160 is the same as the Grizzly H8241 and is for 110v only up to 16 amps. The Woodstock D4151 is the same as the Grizzly H8243 and can be used with 110 and 220 and can be used up to 35 amps on 110, 20 amps on 220. This review is only on 110v usage. I bought mine from Amazon, $11.70 for the 110 4160, $23.00 for the 110/220 4151. I received no documentation for either switch and I couldn’t find any on the Woodstock site; however, the Grizzly site has downloadable PDFs that came in handy. The 4160 connects with 1/4” quick connect tabs that press fit on; the 4151 connects with ring wire terminals that are screwed on (see pic 3 above). The depth of the two switches is different. 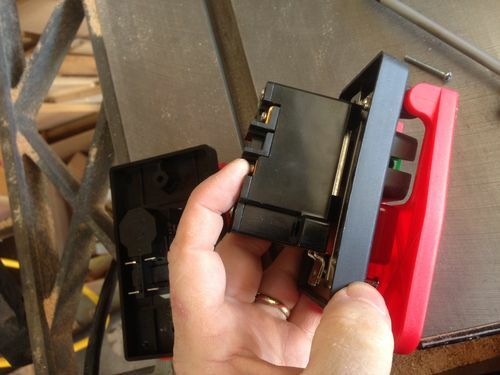 The 4151 will not fit in a drawn steel handy box even without wires installed. It will fit into a gangable switch box. There is one significant difference in usage. The 4151 110/220 is a mechanical switch. Before attaching any wires, you can push in the start button and it will click on, and it releases when you press the stop button. After installation, when I unplugged the saw when on and then plugged it back in, the saw restarted. The 4160 110 switch is a magnetic switch. Before installation, there is no click when pressing the start button nor is it released when pressing the stop button. After installation, when unplugged while running the start button releases and the saw does not restart when plugged back in. They appear to be made by two different manufacturers, and the look and feel of the 110/220 4151 is a bit nicer than the 110 4160. I’ve gone with the 4160 since it is adequate to the saw and I like having the magnetic switch for a bit of added safety. I gave the switches 4 stars since I had to search for instructions and because they just state they can fit into a standard electrical box without giving any guidance which boxes. I have a single phase 240v magnetic switch from Grizzly and that works well. You can rig up a knee switch using a small hinge and a long 2 by. With the mag switch you get the additional benefit that on power outs, the saw doesn’t restart accidently. Nice review. I bought the 4160 for use with my router table. Ditto on having to find instructions on the Grizzly site. I noticed that this switch requires a much more deliberate push on the paddle than the switch that came with my tablesaw. For safety reasons, I would like a more sensitive action so a quick swipe in an emergency would be more likely to trip the router. I also had to force the wiring to fit in a deep switch box. Otherwise, it seems like a good switch. -- Garry, North Carolina woodworker and engineer - The journey you're preparing for has already begun. I use the magnetic version on all my major power tools and I love it. I really do not like the other one. In my opinion it is not as safe as the magnetic one. I sent one of the 4160 switches to my dad, who finally decided that he needed a new switch on his RAS (which, like most tools I’ve seen outside of a professional shop, has used a toggle light switch for longer than I’ve been alive). I also sent him the Grizzly manual as a wiring diagram, but because his RAS is 1.5 hp, now he feels obligated to use a relay. Odiferous, I wondered the same thing and have a pending question out to Grizzly tech support. I decided to go with the amp rating as my guide since the two numbers don’t correspond at all. I’ll let you know what they say. For anyone not able to install one of these switches, a 220 volt furnace switch works well too. Of course it’s a flip switch. After you leaned how to connect these switches, they are are easy to connect. Connect the two wires coming from the wall to the two bottom connections and the two wires going to the motor to the top connections. I bought five Woodstock switches – four of the 110V switches and one 220V switch. All had a wiring diagram on the side. These are not magnetic switches, but have a latching relay that releases when power is lost. The advantage of them being latching relays is there is no minimum load requirement as there is with a magnetic switch. A magnetic solenoid hold the switch in. This si not motor starter but a magnetic switch, ii is. 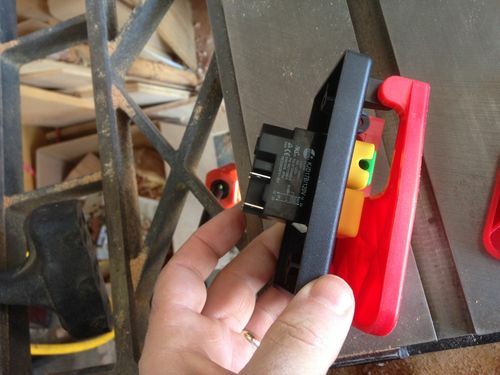 A “magnetic” power switch like those on cabinet table saws incorporate a latching relay to supply the power to the equipment, but they also have thermal sensing to open in the event of an overload. For a magnetic switch to operate correctly, the correct size must be installed for the piece of equipment; i.e., 1hp unit for a 1hp motor, 2hp for a 2hp motor, etc. The less expensive Woodstock switches are simply a latching relay with a rating of up to 16 amps for the 110V and 18 amps for the 220V. There is no thermal sensing. The switch is either on or off by choice and it will stay off in the event of a power failure due to the latching characteristic of the relay. BArnold, what you are talking about I call a motor starter. 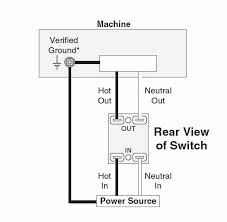 One could call either style of switch a “motor starter” because they both apply power to a motor. Each style serves its own purpose. The Woodstock 110V switch costs about $12. A comparable magnetic switch costs $75 due to the additional circuitry. Thank you for your email dated January 27, 2014. We appreciate your question concerning the H8241 110V Paddle On/Off Switch. This switch is a plain switch and will come back on if there was a power failure. The H8241, H8242, and H8243 are all plain non magnetic type switches. If there was a power failure, the machines with these type of switches would start back up once the power was restored. A magnetic switch will disengage once power is lost and will not come back on when the power comes back. The start button would need to be pushed to restart the machine. If we may be of any further assistance, please do not hesitate to contact us. You are a valued customer, and it is a pleasure doing business with you. That’s interesting nice the description of both the Grizzly and Woodstock describe it as a “magnetic paddle.” The descriptions are identical. Craig answered me as well and reiterated the 1/2 hp/16amp capacity but wouldn’t answer the discrepancy between the hp and amperage ratings.